If one hears mention of trying a drink in Hawaii thoughts turn to a Mai-Tai or a similar cocktail sipped by the pool. Whilst we certainly did partake of such beverages on our last trip to The Islands, this post was inspired by a glass of wine we enjoyed at Red Salt, a wonderful restaurant at Poipu Beach on the island of Kauai. The wine is a dry, crisp rose; ideal as a pre-dinner drink. 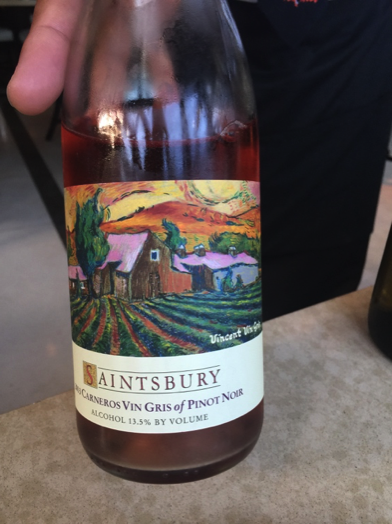 We asked the waiter for more details and he showed us the bottle; a Vin Gris of Pinot Noir from Saintsbury. Neither of us had heard of the winery before, but our ever-present colleague Mr G. Oggle (California Girl Comments: That is GOOGLE for us non geeks) placed the winery just a short distance from our favorite source of sparkling wine in Napa, Domaine Carneros. 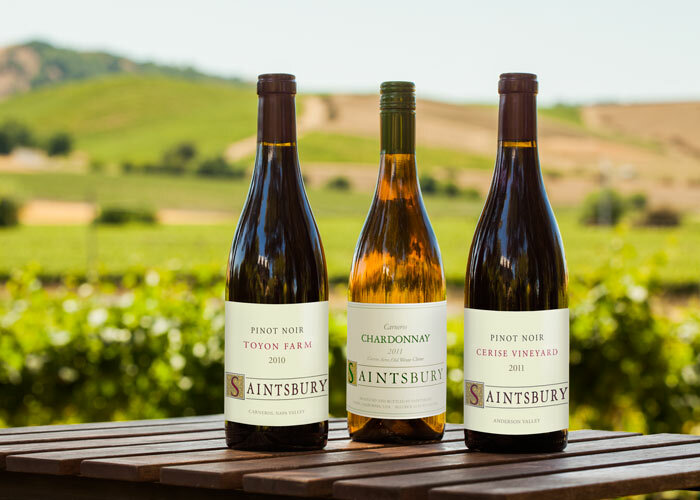 A visit to taste Saintsbury’s wine was added to our to do list. The winery is down a farm road, which is off a side road – not one of those places you come across by accident. Saintsbury does not have a fancy tasting room. 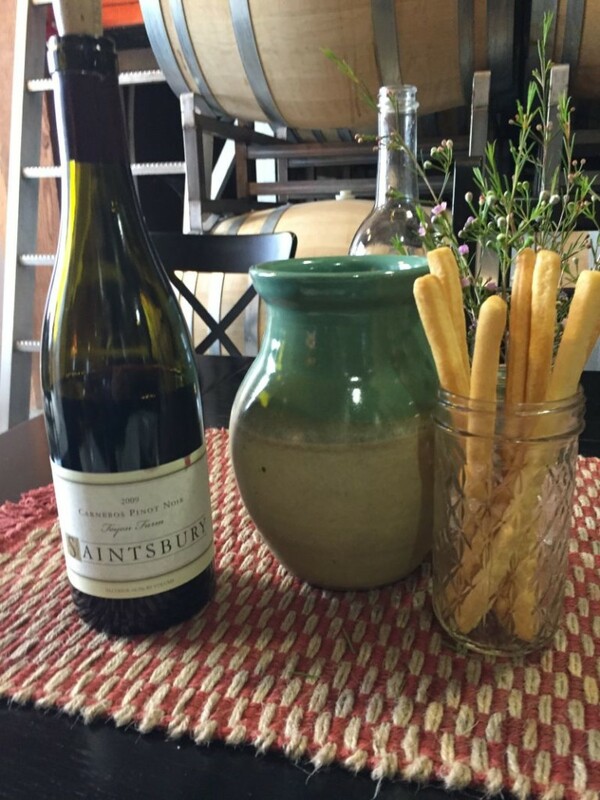 In fact, Saintsbury does not have a tasting room at all. The tasting took place at a table set-up in the barrel room. There is space for outside tasting in the shade of some trees, but this was a damp January day, so the shelter of the barrel room was much appreciated. The rosé that had brought me there was not available as it had sold out several months before. What I did get to taste was a couple of Chardonnay and a range of Pinot Noir, which is their specialty. The tasting was very well constructed; wines of the same vintage from different vineyards, wines of same vintage and source, but of different clones, and finally the same wine from different years. The variations were explained with enthusiasm by the wine pourer; her involvement beyond just pouring added to the experience and my appreciation of the wine. California Girl Comments: I didn’t taste the wine that day, I was doing my good citizen duty of being the designated driver. I think I deserve big bonus points, a parade, big diamonds, something for my sacrifice. Right?